Here’s April’s information about the phases of the moon and signs of the zodiac. This information can and should be used for planting anywhere, indoors or out, if you want to help your veggies produce more, your floors bloom more abundantly and your growing things go generally thrive. CAUTION: An early reminder here - no matter how anxious you might be to get started, don’t plant if the ground is wet. You’ll pay for your exuberance all summer – and it won’t be in a pleasant way. General Tips for dark- and light-moon activities are below. April begins – and ends - with the dark moon in force. The dark moon rules until the new moon – or no moon visible in the sky – arrives at 4:50 a.m. EDT April 5. The light moon is then in force until the full – or dark moon - returns at 7:12 a.m. on April 19. When the full - or dark - moon is ruling, plant only those veggies that produce below the ground. When the light moon is in force, plant those that produce above the ground. Ideally, check the signs and plant when one of the fertile signs rules. Don’t plant when the killing signs Aries or Leo are in force. 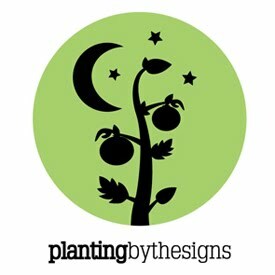 Remember: Check to see if the moon is in the light or dark phase (information above) before proceeding with any planting anywhere, or other activities. If you can only utilize one aspect of this system for planting – moon’s phases or zodiac signs – I would suggest following the phases. Ideally, and if the weather cooperates, use both. April begins, and ends, with the fertile sign Pisces (the feet), so that’s where we will begin, too. Fertile days: These are the most fertile signs in the zodiac. Here’s is in order. Pisces (the feet), April 1-2, 28-30, all dark moon; Taurus (the neck) rules April 6-7, light moon; Cancer (the breast) April 10-12, light moon; and Scorpio (the secrets), April 19-20, dark moon most of the 19th and all the 20th. There are 12 days this month ruled by the most fertile signs: Scorpio, Pisces, Taurus and Cancer: seven with the dark moon in force, five with the light moon. Simply incredible! If we were statistically past the danger of frost and freezes, it would be full speed ahead. But alas, we’re not. But if you’re starting plants or planting in a green house or somewhere you can protect tender plants, then have at it. I can only hope May and June are like this! Killing signs: No planting, transplanting, or dealing with things you want to thrive should occur on these days. Reserve them for cultivating your garden, cleaning out fence rows — anything but planting. Here’s when they rule this month: Aries (the head), April 3-5; and Leo (the heart) April 13-14. There are five killing days this month. Gemini days: Gemini (the arms) rules April 8-9, with the light moon in force. Even though some might say it’s late for peas, I don’t necessarily agree. I think these days are perfect – if your ground is dry. And now we come to beans. Technically, it’s too early and the ground temperature is still too cool. But if you want to experiment, try a few beans. You might just get lucky and have an early crop – and if you’re not lucky, there’s plenty of time to replant. Flowering days: Virgo (the bowels) rules April 15-16 and Libra (the reins) is up for April 17-18. There are four flowering days again in April. These are bloom days and flowers planted now should bloom and do so abundantly. Just be aware of frost or freeze potential and be prepared to protect them. I would avoid planting veggies unless you’re planting for the blooms – which you’re not! Veggies planted when flowering signs are in force tend to spend more time blooming than setting fruit. So-so days: These aren’t particularly fertile nor destructive, just so-so. Sagittarius (the thighs), April 21-22; Capricorn (the knees), April 23-25; and Aquarius (the legs), April 26-27. There are seven days this month ruled by the so-so signs. Making changes: If you have changes to make like stopping smoking, starting a diet or exercise program, weaning small children or animals, scheduling elective surgery – anything that requires making a change – the best time for that is when the moon is in the dark phase and the signs are going out of the body beyond anything that functions. Some months we have a lot of days that fit that formula perfectly; other months not so many – on down to when there are none. This month we have a bunch – 12 to be exact! The perfect days are April 1-2, 21-30. The signs involved are Sagittarius/thighs through Pisces/feet, April 21-30, and two additional Pisces days to kick off the month on April 1-2. Pouring gravel: If you have gravel to pour on a drive or road on your farm, do that when the light moon rules, which is most of April 5 through April 18. The same applies for stones on a garden path: Place them when the moon is in the light phase, so they don’t sink. If you’re setting fence posts, do that in the light phase of the moon so the posts don’t sink. PBTS NOTE: All times given are EDT. Convert any times to where you are.